Smaller type multi systems such as the one on the left provide independent and economical heating to multiple small offices located in the same building. You may be surprised that these types of installations can pay for themselves in reduced running costs compared to older style electric only heating systems. For smaller offices and buildings in built up areas it can at times be impractical to have numerous outdoor condenser units supplying a number of indoor units. Manufacturers such as Mitsubishi offer multi systems where one multi output outdoor unit runs and controls a number of indoor units thus solving the problem of where to physically locate multiple outdoor units. 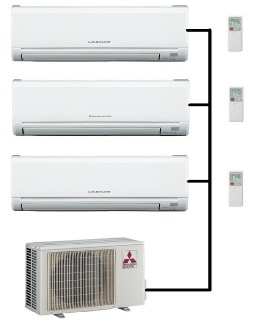 A typical example might be the Mitsubishi SCM60ZJ-S outdoor unit that can run three indoor units, see the picture above. In this example you may have three small offices with an indoor wall unit in each office. Each indoor unit can be set for a different temperature in each office. These types of configurations are popular in offices such as estate agents practices where there might be multiple small to medium sized rooms all requiring to be heated or cooled.